I did not get video of the mink trying to steal the fish, but I did get some video of it in one of the boats scrounging for food. We had pulled up the boats and were waiting for the float plane when the little bugger hopped from the dock into one of the boats. The mic on my camera was not equipped to register the hissing noise. It’s really quite frightening. I was looking through the Lowes flyer this weekend hoping to find a great deal on windows when I came across their Katrina Cottages plans. The idea is quite intriguing, but the there’s very little on the site that details what the total costs will be. It’s mostly just the plans for sale, and they’re being sold as replacement shelters… or vacation homes. The plans are rather simple, and the artistic renderings are somewhat attractive, but the photos on the website are a little less so. Maybe it’s just my aversion to the look of modern building materials. I’m partial to the ideas at the Open Architecture Network, which seeks to be a cooperative/clearinghouse for shelter and structure ideas. My dad and I joined 12 other Stuehrenberg men (most of whom, like my dad, married into the family) on a fishing trip to Birch Lake, Ontario. We spent a week off the grid in a cabin that had some solar powered lights and gas appliances, but otherwise was primative. We fished like kings, lived like kings and dined like kings. Fried walleye is hard to beat. As is grilled walleye. And curried walleye. For those of you who don’t want to read about a fishing trip, but are marginally curious what one looks like, you can skip to the photos. Flying in to Mineapolis-St. Paul was great. We say hundreds of square miles of lucious green trees and neighborhoods much like those here in North Portland. We also caught a glimpse of the collapsed inerstate bridge, which despite the horror of it, was really cool to see. The river is much more narrow than you’d expect, and it just looks surreal sitting next to a series of functioning bridges. From there, we caught a puddle-jumper via Hibbing to International Falls, crashed for the night, then rallied with all the uncles and cousins. We crossed the border like it was 1999 and took two float planes 200 miles north to Birch Lake. It was my first float plane ride, and my first viewing of lake country. It was beautiful to see so much empty, boreal forested land rife with lakes. It was also cool to see some of the Canadian Shield, and even bring some home. How many people have a 1+ billion year old door stop? Some of my family are Bible literalists, so I didn’t make much of a to do about the age of the rock. The day we arrived was quite windy, so we took our time getting settled in, geared up, and worked up. Finally, with the sun out and rather big waves, we couldn’t take it anymore and ventured out for calm waters. No one caught fish in the big wind, but just as the sun was setting, people started catching walleye right in our own bay. Subsequent days varied in weather, but we continued to catch fish like crazy. The morning of the second day I headed out with my dad, one of his high-school buddies and we hit the fish. We were jigging, something than I’d never done before, and seemed rather boring at first, but there’s something mildly therapeutic about bouncing a weighted hook with a minnow on it off the bottom of a lake. Knowing which color of jig head to use seemed to be key in our success, so at lunch we’d share our location and tactics with others, and of course, share fish stories. While cleaning fish and helping people on the dock, I came back to find a mink pulling a stringer of fish away. He was difficult to dissuade, and didn’t seem to mind the stomping. Dustin caught a fishing pole and reel. 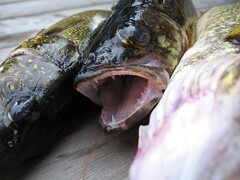 I caught a walleye on a leftover sausage, but the jighead came untied at the edge of the boat. Nate caught a huge walleye that fought like crazy, and I snagged it’s tail. There are of course, many, many more. But not being there would make them boring. Our activities were somewhat limited because the forest is so dense you can’t walk, and so we fished, ate, played cards, and slept. It was the perfect escape. Add to that constant loon-song, eagles fighting for fish remains, an otter, the mink, and the sheer beauty of the northern woods, and you’ve got an escape. Sadly, we had to return.